The thirty-third Bilderberg Meeting was held at Arrowwood of Westchester, Rye Brook, New York, on May 10, 11, and 12, 1985. At the request of Mr. Walter Scheel, Chairman of the Bilderberg Meetings, who was unable to attend because of the serious illness of his wife, Lord Roll of Ipsden opened the conference, and Mr. Giovanni Agnelli presided over the closing session. There were 113 participants from 19 European nations, the United States, Canada, and various intergovernmental organizations. They came from government, politics, business, industry, finance, trade unions, diplomacy, the law, education, journalism, the military, and institutes specializing in national and international studies. All participants spoke in a personal capacity, without committing in any way the organizations or governments to which they belonged. As usual at Bilderberg Meetings, in order to permit frank and open discussions, no reporting of the conference sessions was allowed. In opening the conference, Lord Roll conveyed to the participants Mr. Scheel’s regret at not being able to attend and his best wishes for a successful meeting. In addition, he read the text of a message of thanks and good wishes to the American people, to be sent on behalf of all those at the Bilderberg Meeting to the President of the United States. 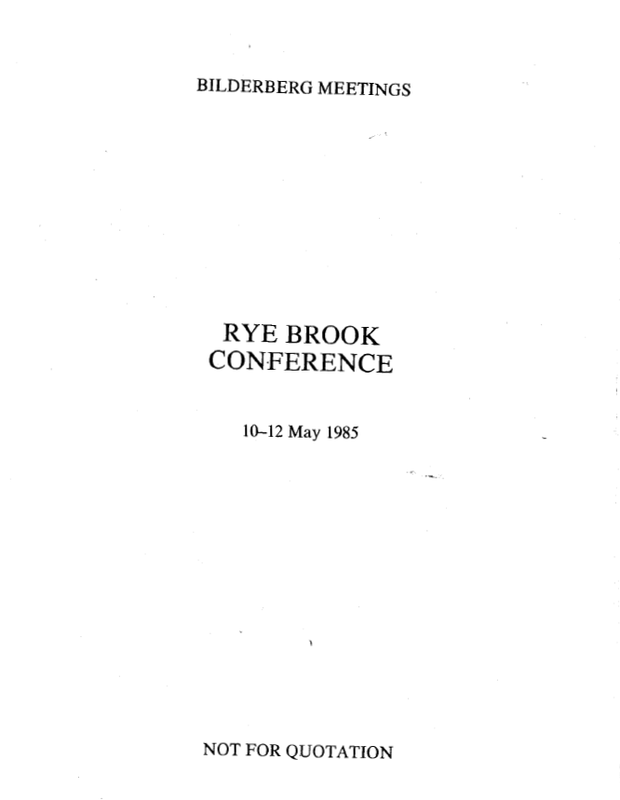 Lord Roll observed that this year’s conference was taking place just a few days after the fortieth anniversary of VE day. Out of that event had grown the NATO Alliance, and Bilderberg, while not formally a part of the Alliance, had been born alongside it. In its 32 meetings, Bilderberg had proven its value by bringing together, in an environment conducive to the free and open exchange of views, those people who had to create and carry out policy, make decisions, and form opinions in the countries of North America and Western Europe. II. HOW SHOULD THE WEST DEAL WITH THE SOVIET BLOC? IV. HOW SHOULD THE WEST DEAL WITH DEVELOPING COUNTRIES?